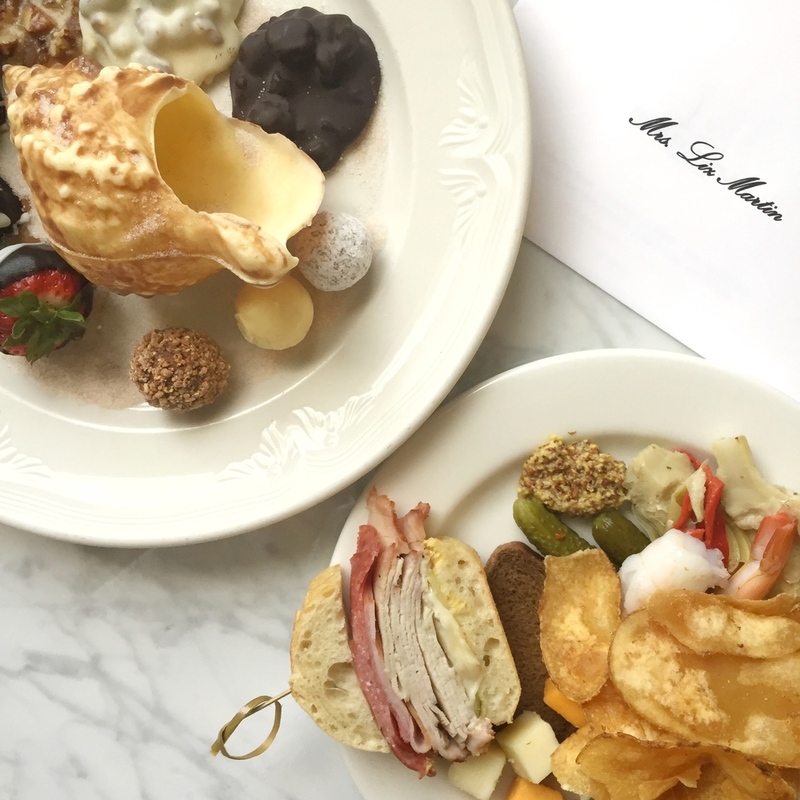 I was so thrilled when I was invited to the Belmond Charleston Place for a complimentary staycation to help promote their August special for locals! Through August 31st you can get 25% off the best rate, plus 25% off spa treatments and dinner at the acclaimed Charleston Grill. This is a special only for YOU, Charlestonians (You need to be a Charleston, Dorchester, or Berkeley Country resident and use promo code locals only). This was the hotel we stayed at on our wedding night, so my husband and I were so thrilled to be back! Lots has changed and tons of improvements have been made in the last 5 years so I can't wait for you to see some of the details. I haven't been THIS relaxed in a long time, so thank you so much to Charleston Place for giving us a much needed ESCAPE! Follow me on Instagram for more of my photos from our stay, and check out #charlestonplace to see how much fun other guests have at this great Belmond hotel! Prior to check-in we tried the new Meeting at Market for lunch. It had great service & delicious food, especially considering it is less than a month old! This isn't surprising, though, if you have eaten at any of the other Charleston Place restaurants. With tons of giant TVs, this would be a great spot to come for football season, and we really enjoyed catching the Olympics while eating some non-traditional sports bar food. When we checked into our room on the 8th floor, I was so impressed with the chic renovations! This was always a classic southern hotel, but they have really gone all out with marble everywhere and modern but calming updates to the decor. My main goal for this staycation was to get in as much pool time as possible. Mission accomplished, because we spent hours and hours there! Between the pool, hot tub, brand new private rooftop bar, and killer King Street views we were all set! The pool is on the same level as the spa, & judging from the delightful staff and all the great products they offer I bet it is fabulous as well! So, later that evening I had my outfit all planned and great intentions of enjoying dinner at the hotel followed by a martini at the Thoroughbred Club (in the lobby). Well that was before we started noshing at the club level spread on the way back from the pool. These people feed you all. day. long. We grabbed a few plates of delicious appetizers and took them back to our room, only to discover the craziest plate of sweet treats awaiting us. It took me a very long time to realize this seashell was actually made of chocolate, ha! Needless to say we ate our little hearts out and were not motivated to go anywhere the rest of the night. That's kind of how we like to roll when we are on a getaway; in bed by 9pm is a sign of a successful staycation in my book! The next morning the club level had plenty of great food for us again, so we enjoyed some breakfast and coffee in bed to start the morning. I recycled my dinner dress to wear for a day on King Street strolling. I had a great time walking around with Jonathan, and it's amazing how your perspective of your town changes when you are living like a visitor. What are you waiting for?! 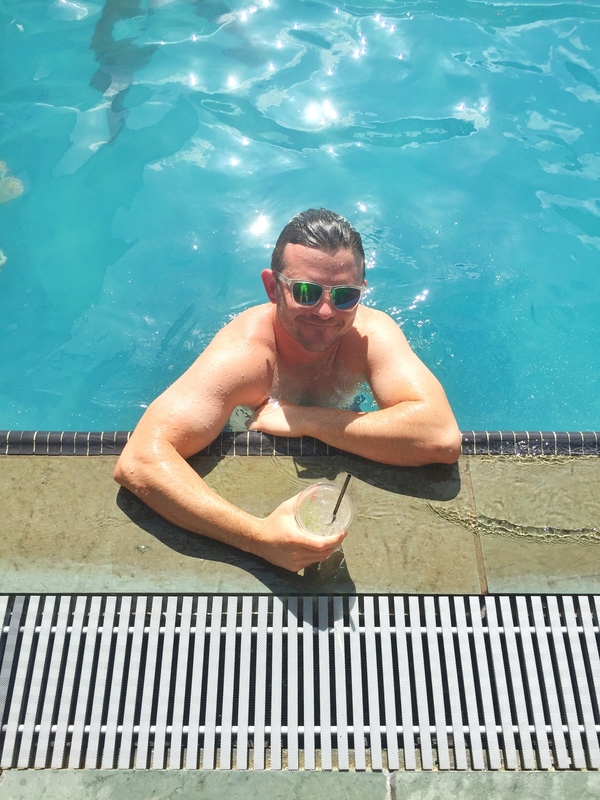 Call Belmond Charleston Place and treat yourself to a little staycation of your own while you can score 25% off, and check out some of my other tips to live like a tourist in your own city here.